Newborn nappies up to 5kg, 28 pack. More absorbent than ever, now with up to 12 hour absorbency protection. Designed to suit each stage of your baby's development, MAMIA® nappies feature greater flexibility and an even better fit with stretchy COMFY FLEX® sides. MAMIA® Newborn nappies feature a new active absorption core which has more super-absorbent pearls than ever before, keep's your baby's skin dry, even during long naps. Giving you peace of mind that your baby can have a restful sleep. Your baby will have complete freedom to move while COMFY FLEX® ensures a perfect fit, with overlapping tapes that allow your baby to be extra snug and comfortable. MAMIA® nappies are also unisex, with a full length core that runs from the front to the back of the nappy and suitable for sensitive skin. 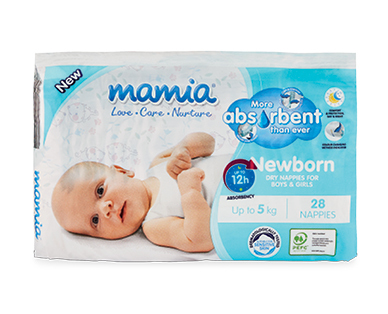 MAMIA® Newborn Nappies also have a soft and flexible elasticised waistband and wetness indicator that turns blue when wet, for more peace of mind.